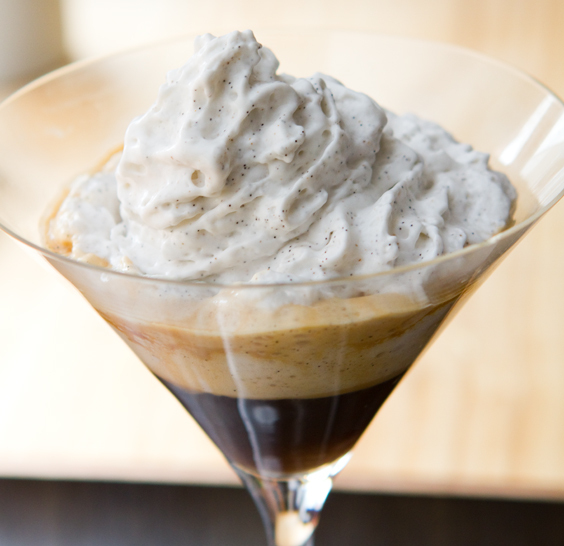 Coconut Whippuccino: would you like espresso with that whip? Apparently today is National Coffee Day. Seems timely for me since I just recently reignited my espresso habit. And it's all thanks to this drink: The Coconut Whippuccino. I call it my "Would You Like Espresso with that Whip?" special. 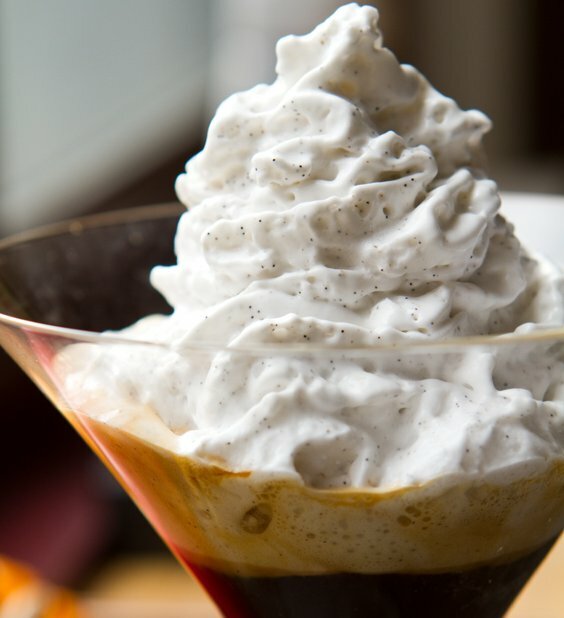 You must cheers with me on this one..
Mountain of vanilla-bean whip. Some espresso hiding under there too. 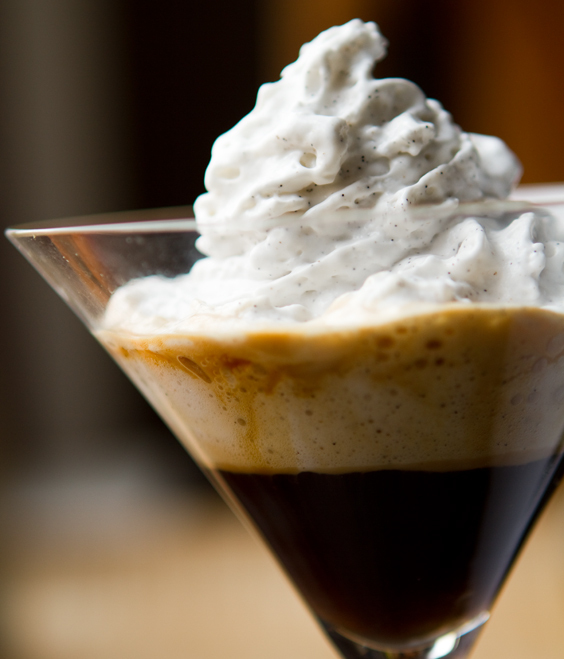 A fuzzy foam of caramel colored coconut-espresso-foam gathers between the layers..
Hello Caffeine. I usually drink chai lattes. Really, I do. I had finally (and proudly) squashed my "too-many-espresso-bevies-a-day" habit a few years back. Since then, I happily limit myself to one large soy latte a week. Sunday brunch. Usually at Le Pain Quotidien, they make a super soy latte. Yup, I was totally happy ditching coffee during the week. Until now. Until my discovery of the most perfect coffee-thing ever. 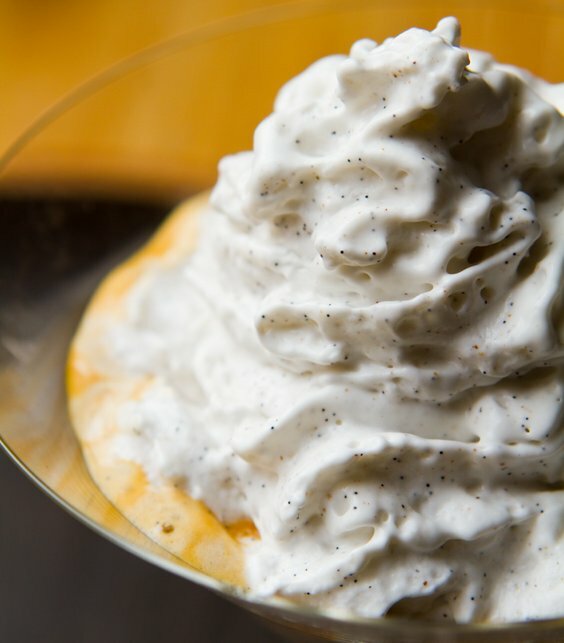 Vanilla Bean-specked Coconut Milk Whip. Swirled. Aerated. From a can. But still homemade. Creamy. Full fat coconut milk. Sweet. Frothy. And totally vegan. It's my new habit. Swirling this stuff on top of tea, chai, smoothies, pudding, pie - and espresso. 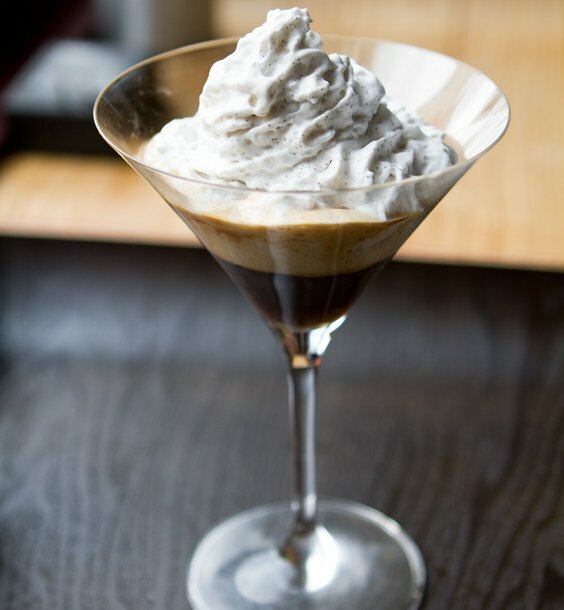 A nice shot of espresso doused with a pile of coconut whip. That's what has brought me back to mid-week espresso jitters, coffee cravings, bulging eyeballs. Maybe the bulging eyeball thing only happens in comic books. But you get the point. 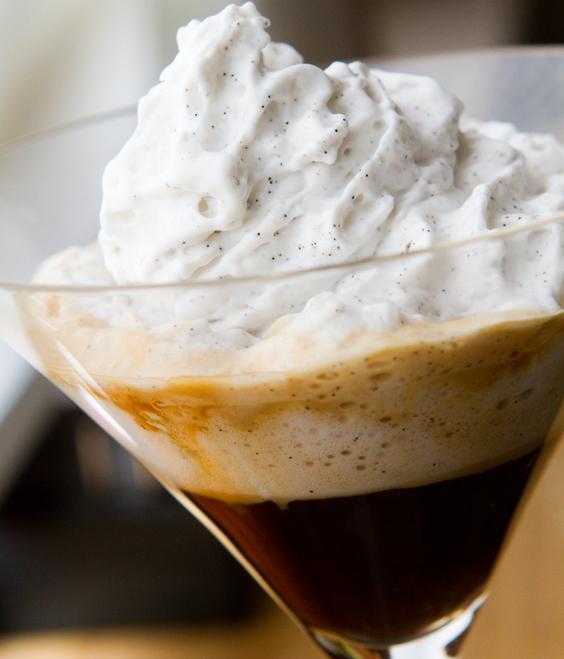 Yup, it's 8am and I'm darting for my Nespresso machine to slurp down some coconut whip coated espresso. Just two button pushes away from "bliss". Push one: Nespresso. Push two: iSi whip can. Slurp. Shoot. Am I really back to coffee? OK honestly, I don't think this coffee-kick will last. My "kicks" never do. I usually play them out until I get sick of them. And I'm sure I'll be craving my "chai habit" very soon. Especially when the fall weather kicks in. Blustery breeze. Spicy chai. I'm feeling snuggly (and less jittery) already. 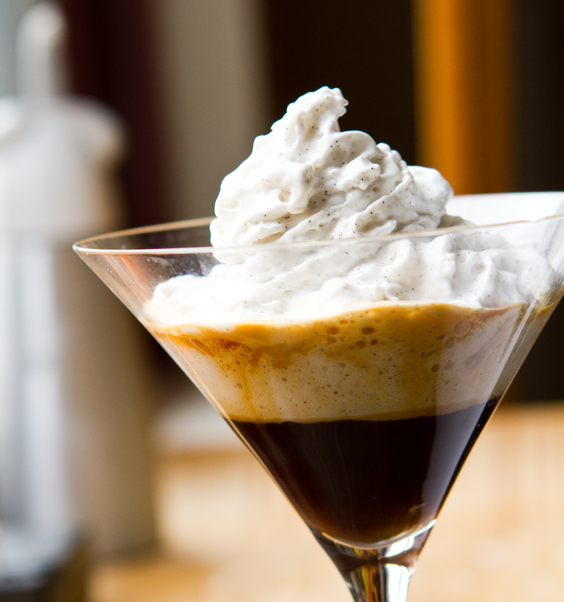 Yes, I could just as easily make this a chaippuccini with whip. Right? Hmm..how much coconut whip to add? Answer: a lot. -> Espresso shot. Top with whip. Serve. Crave another. 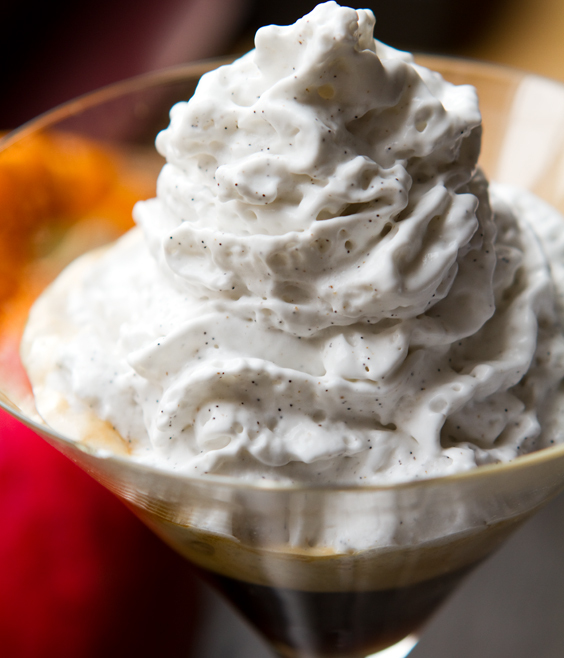 How-To: Coconut Vanilla Bean Whip. I talk about it in this post. But it's pretty simple to explain quickly. 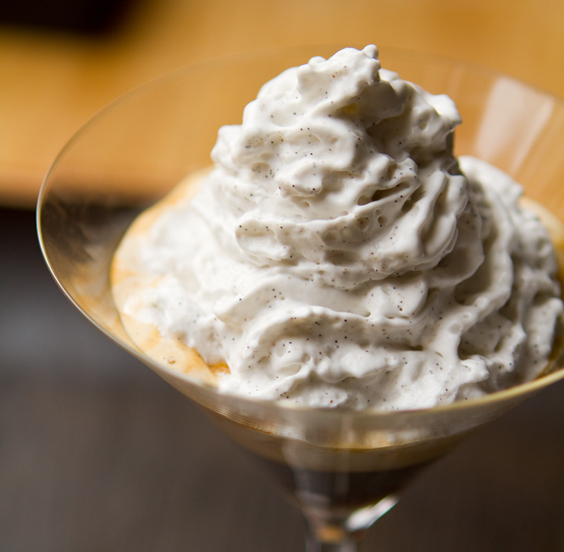 I bought this at-home whipped cream frothier by iSi. It's made for dairy cream - but yes, it totally works with full fat coconut milk. 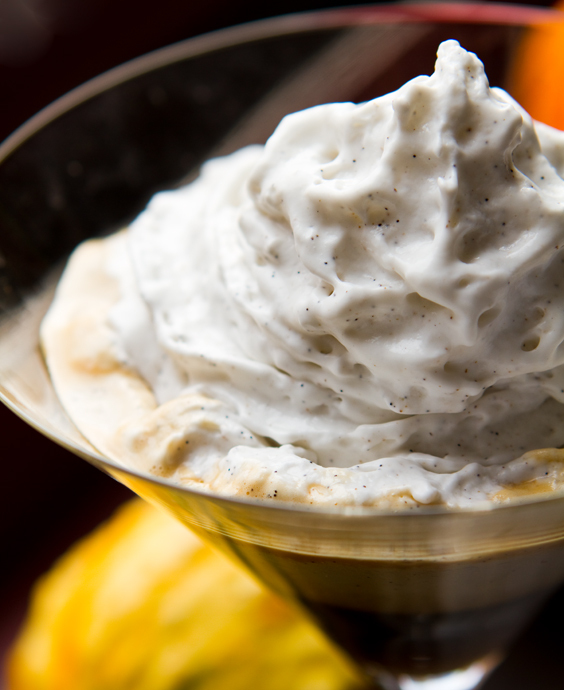 Coconut Whip Recipe: Chill a can of coconut milk. Scoop the top 2/3 of the can out - add to whipped cream can. I add a few spoonfuls of powdered sugar, a pinch of my vanilla bean specks, follow instructions for aerating and shake. Don't own an iSi frother? 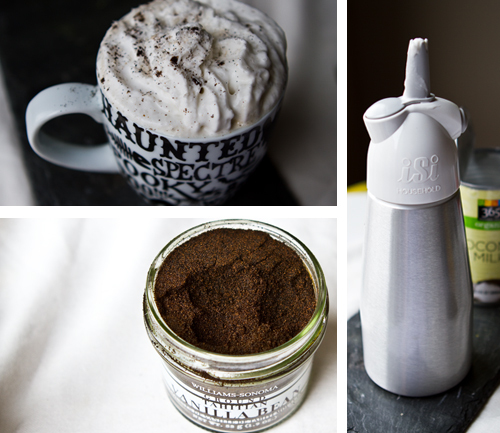 Make some whip the old-school way OR..
iSi Whipped Cream Frother - I use it for vegan cream! The Vanilla Bean Specks from Williams/Sonoma are a super yummy add-in..